This Swiss made MES lock kit includes Premium low friction door lock actuators. This lock fit was designed to easily add the convenience of power door locks to most cars and trucks with standard mechanisms. This kit is central locking, which means that simply locking or unlocking either door from the knob or key will automatically lock or unlock the other door. 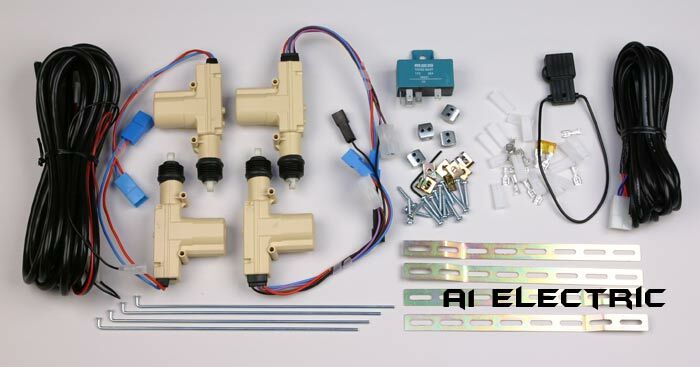 This kit easily interfaces with most keyless entry systems and alarm systems with negative door lock outputs. The low friction actuators in this kit reduce door lock knob effort that is increased' when installing an aftermarket door lock kit. This kit comes complete with wiring, hardware and instructions. Photo of complete lock kit. If switches are desired, use part number DLSW-1 DLSW-LT or SK1-OEGM. Want to add ignition controlled door locks without adding a keyless entry? Just install a DP452T with your lock kit.